The most valuable component of biogas is methane (CH4) which typically makes up 60%, with the balance being carbon dioxide (CO2) and small percentages of other gases. However, biogas also contain significant amount of hydrogen sulfide (H2S) gas which needs to be stripped off due to its highly corrosive nature. Hydrogen sulfide is oxidized into sulfur dioxide which dissolves as sulfuric acid. Sulphuric acid, even in trace amounts, can make a solution extremely acidic. Extremely acidic electrolytes dissolve metals rapidly and speed up the corrosion process. The corrosive nature of H2S has the potential to destroy expensive biogas processing equipment. Even if there is no oxygen present, biogas can corrode metal. Hydrogen sulphide can become its own electrolyte and absorb directly onto the metal to form corrosion. If the hydrogen sulphide concentration is very low, the corrosion will be slow but will still occur due to the presence of carbon dioxide. The obvious solution is the use of a biogas cleanup process whereby contaminants in the raw biogas stream are absorbed or scrubbed. 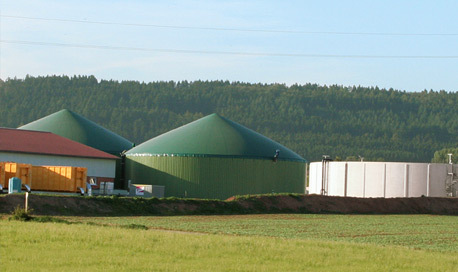 Desulphurization of biogas can be performed by biological as well as chemical methods. Biological treatment of hydrogen sulphide typically involves passing the biogas through biologically active media. These treatments may include open bed soil filters, biofilters, fixed film bioscrubbers, suspended growth bioscrubbers and fluidized bed bioreactors. The simplest method of desulphurization is the addition of oxygen or air directly into the digester or in a storage tank serving at the same time as gas holder. Thiobacilli are ubiquitous and thus systems do not require inoculation. They grow on the surface of the digestate, which offers the necessary micro-aerophilic surface and at the same time the necessary nutrients. They form yellow clusters of sulphur. Depending on the temperature, the reaction time, the amount and place of the air added the hydrogen sulphide concentration can be reduced by 95 % to less than 50 ppm. Most of the sulphide oxidising micro-organisms belong to the family of Thiobacillus. For the microbiological oxidation of sulphide it is essential to add stoichiometric amounts of oxygen to the biogas. Depending on the concentration of hydrogen sulphide this corresponds to 2 to 6 % air in biogas. Measures of safety have to be taken to avoid overdosing of air in case of pump failures. Biofiltration is one of the most promising clean technologies for reducing emissions of malodorous gases and other pollutants into the atmosphere. In a biofiltration system, the gas stream is passed through a packed bed on which pollutant-degrading microbes are immobilized as biofilm. A biological filter combines water scrubbing and biological desulfurization. Biogas and the separated digestate meet in a counter-current flow in a filter bed. The biogas is mixed with 4% to 6% air before entry into the filter bed. The filter media offer the required surface area for scrubbing, as well as for the attachment of the desulphurizing microorganisms. Microorganisms in the biofilm convert the absorbed H2S into elemental sulphur by metabolic activity. Oxygen is the key parameter that controls the level of oxidation. The capital costs for biological treatment of biogas are moderate and operational costs are low. This technology is widely available worldwide. However, it may be noted that the biological system is capable to remove even very high amounts of hydrogen sulphide from the biogas but its adaptability to fluctuating hydrogen sulphide contents is not yet proven.